This would be perfect in our household...it's simple, colorful, easy-to-spot and brings back memories for my husband who lived in Switzerland for stint. I need some extra encouragement to organize my first-aid supplies, which are truly all over the cupboard and house. Little red box, I'll be thinkin' about you. You can find store locations here or find it online here. p.s. although not listed as a shop that carries its products, I did notice 2 of these boxes at Zinc on Fillmore in San Francisco a couple of weeks ago. I think this is a really great idea. 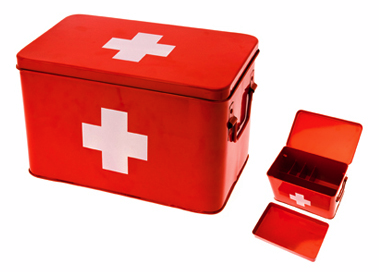 My Dad had an awesome first aid box and growing up it was the best when he would pull it out, because you knew you were going to be okay. We all knew where it was and it was always stocked. After he passed away it was a coveted item! Good plan. I love this box! My supplies could use some good organizing too, and I love how this box is vintage-ish, yet very functional. Cute, I NEARLY bought one of these the other day at a gift store in town. Now you've made me want to go back and get it.